What can you do about dementia in dogs? The terms canine dementia is often used to describe cognitive dysfunction syndrome (CDS) in our dogs. The symptoms of CDS are similar to Alzheimer symptoms in humans but it is not dogs Alzheimer as such. Still like Alzheimer, cognitive dysfunction in dogs is the result of physical and chemical changes that affect the brain function in our pets. Canine dementia is unfortunately not curable. However, with the right management it is possible to improve the quality of life for pets with dementia. The dog owner plays a critical role here. First by being vigilant for any symptoms of CDS in their pets. Early diagnosis and intervention can really help to delay the progression of the disease. The dog owner is then responsible for following the Vet's advice about managing the disease. It is important that the owner is committed to the treatment required. Treatments for cognitive dysfunction (CDS) in dogs normally include prescribed medication and SAM-e supplementation. In addition, it can help to provide adequate physical and mental stimulation and make some dietary and environmental changes. Think hard if and then how you can make changes your dog’s environment to make his life easier as he gets older, and more confused. For example, keep all your dog’s essentials in one place and easily accessible. Consider lower sides for easier access (e.g. to beds) and / or ramps to help your aging pet to get where he has to go. You may also want to add extra water bowls around the house and leave stimulating toys and treats out for your dog. Dogs also rely heavily on smell so you can try to use that to help your older dog to finds his way around the house. Also, take your dog regularly outside to relieve himself. This will minimize the risk of accidents indoors. When you must leave your dog alone, provide secure confined space, e.g. crate or leave him in one room only. Most dogs find den like spaces comforting and confined spaces should prevent your dog from feeling lost. Strict routine will also help and being consistent with commands and rules has never been more important. And remember, our behaviour can affect our dogs. It is therefore important that you stay calm and avoid causing your senior pet any unnecessary stress. It is important to continue to keep your dog as active as possible, i.e. as appropriate for its age and physical condition. Physical exercise is not enough, mental stimulation is as important. Most games include both physical and mental stimulation so continue to play with your dog. There are some great toys and puzzles available that provide excellent mental stimulation for your pet. As your dog’s condition deteriorates, you will need to be more creative in how to provide necessary stimulation. Just like us, our dogs need to exercise their brain as well as their body. Not using the brain enough can affect our dogs' cognitive functions and problem-solving skills. It is never too late to start exercising your dog’s brain. You can indeed 'teach an old dog new tricks'. It just takes longer. 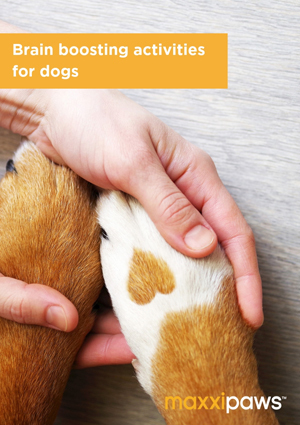 But it can still be as fun and rewarding for you and your dog. Socializing with other pets and people is also mentally stimulating. However, for dogs with dementia socialization can become stressful. So carefully supervise the social interaction of pets with dementia. Canine dementia affects your pet social ability. Previously friendly pets may become tense, anxious, and even plain aggressive. This may therefore not be a good time to introduce new pet to the household as it can add more stress to your old pet. As your dog gets older you need to take it more often to the Vet for regular health checks. Why is this important? Because it is easier to treat any health problem when they are detected early on. Dogs with dementia have lot to deal with so keeping them as physically healthy as possible will help ease their stress and discomfort. Good tip is to keep a diary of the signs your god is showing and rate them (1-10) on daily basis. This will help you, and your Vet, to follow the progression of your dog’s dementia. Nutritionally balanced diet is vital for your dog’s overall health, no matter what age your dog is. Like they say, we are what we eat and the same applies to our pets. With age, your dog is likely to suffer from some other health problems. Some, e.g. diabetes and liver disease, may require changes to your dog normal diet. It is recommended to liaise with your Vet before making any changes to your senior pets' diet. Under all circumstances, it is important to make sure your pets' diet contains enough fatty acids and antioxidants (like vitamins A, C, and E), as both are very important for cognitive health. If needed, consider adding quality fatty acid supplement like maxxiomega to your pets' diet. There are some prescribed medications available for canine dementia. Medication will not cure your dog’s dementia but they can help to manage the signs and slow down the degeneration of the disease. The best know prescribed medication for canine dementia is Selegiline hydrochloride (a.k.a. L-deprenyl hydrochloride). Selegiline was originally developed for human Alzheimer's and Parkinson's disease but is now also used for Canine Cognitive Dysfunction and Cushing’s Disease. The best-known veterinary brand names are Anipryl in the US and Selgian in UK. Selegiline enhances the amount of chemicals within the brain that act as messengers between individual nerve cells and prolongs the activity of your pet's remaining dopamine. In studies, pet owners reported that 69% to 75% of dogs improved in at least one clinical sign after one month of Anipryl therapy (CDS In Dogs). The same studies showed that the most common side effects were vomiting, diarrhoea, and changes in behaviour, such as hyperactivity and restlessness. Most of the side effects were mild to moderate. Propentofylline is another commonly prescribed medication for canine cognitive dysfunction. Propentofylline increases the blood flow to the brain and is used to manage signs of dementia. It has been shown to improve the pet's energy levels and concentration. Studies have shown that the concentration of SAM-e in the body (including the brain) declines with age. There is no food source of SAM-e so supplementation is required to increase the level of SAM-e in the body. SAM-e supplement for dogs is a safe and effective way to stall or improve mental decline in senior pets. SAM-e helps increase dopamine function in the brain, stimulates the brain function and works as an antioxidant. What's more, it is generally accepted in the psychiatric field that SAM-e is effective for depression. Veterinary medicine does not use the term depression as such but many of the symptoms in dogs with dementia are similar to depression in Alzheimer patients. Agitation and lack of responsiveness to their loved ones are common among human Alzheimer patients as well as among pets with dementia (A Roundtable Discussion). 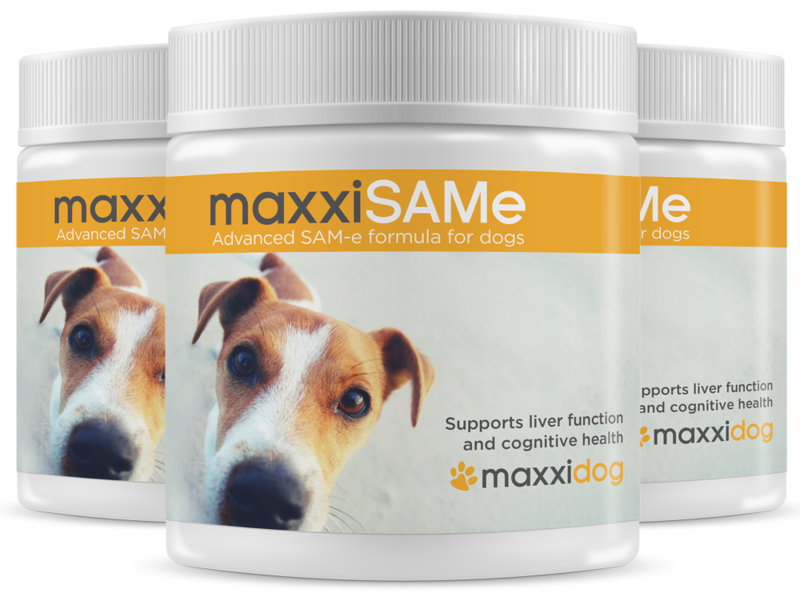 maxxiSAMe is an advanced SAM-e formula for dogs that can hugely benefit dogs suffering from cognitive dysfunction, or dementia.